© 2016 Idyllwild House Publishing Co.
South Ridge Trail • One-way distance = 4 miles; Elevation gain in feet = 3,600; Strenuous • Dogs on leash OK • Tahquitz View Dr. to Tahquitz Rock. There are no fees for permits. Permits cover up to 12 people in a group. A day-hike permit is not needed if you already have an overnight permit. Click on image for large map. 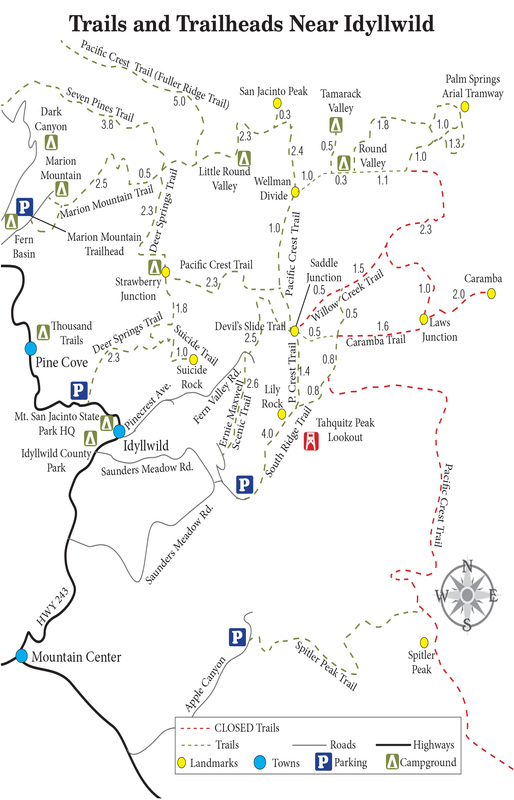 Explore 4.5 miles of hiking trails. Enjoy a family picnic. Stop in the museum and discover live animals, native culture, local & natural history, and a nature store. lakehemetrecreation.com – Open year-round. 12 miles of shoreline. Camping, RVing, fishing, cafe, swimming and the new water play structure (open from Memorial Day to Labor Day). Perfect for families and guests looking for a fun outdoor experience. 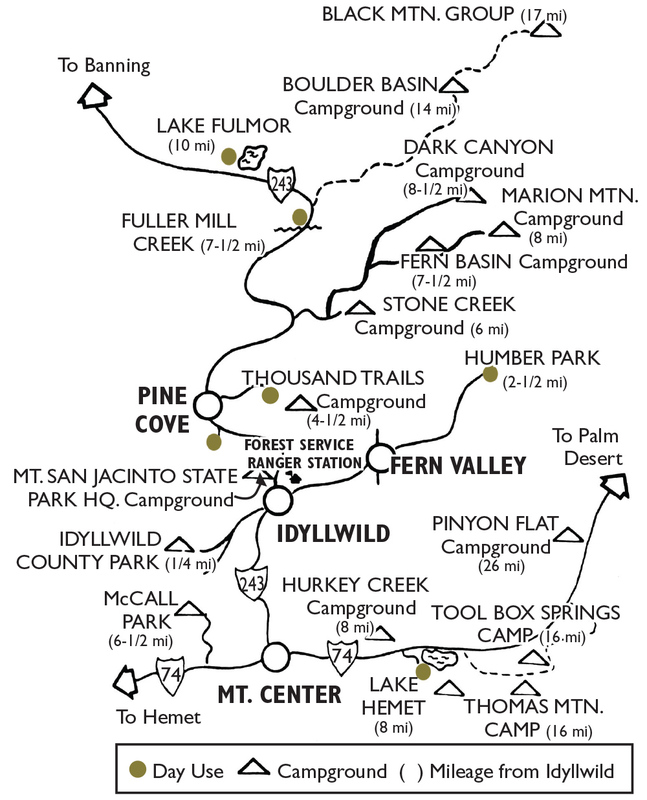 Click on image to view larger camping map. Licenses are required for anglers ages 16 and over with a daily bag limit of five trout during the year-round season. One-year licenses are available to California residents at Village Hardware and Lake Hemet Market. Visit www.wildlife.ca.gov/licensing/fishing/ for 2015 license rates and free fishing days throughout California. 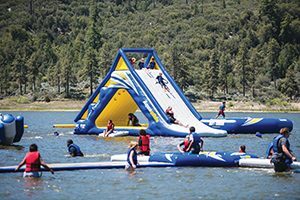 Equipment and bait may be purchased at Lake Hemet Market, Pine Cove Market and Village Hardware. Fairway Market and Forest Lumber also stock some supplies. 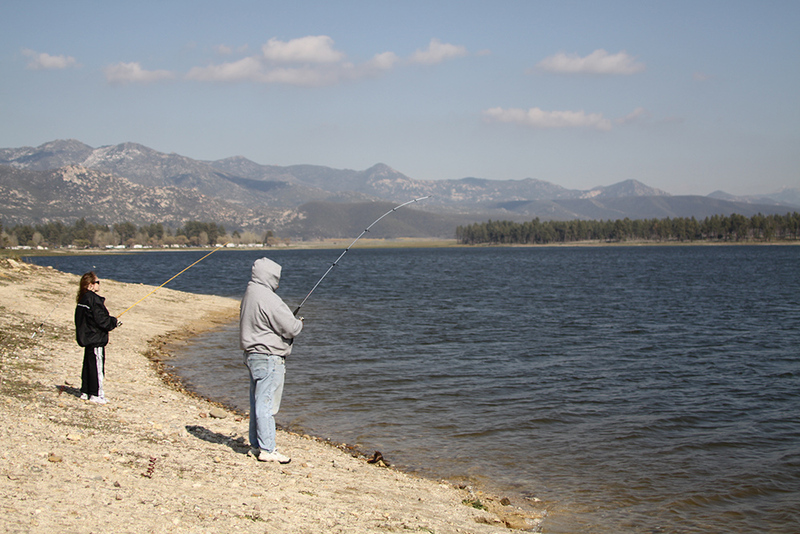 Lake Hemet is stocked throughout most of the year with rainbow trout but natural channel catfish, big-mouth bass and bluegill also provide good sport fishing. It is about 4 miles south of Mountain Center on Highway 74. It is owned and operated by the Lake Hemet Municipal Water District. Public recreation areas are on the lake’s shores. The Forest Service maintains a picnic area for day use along the north shore, the water district on the other shores. The water district also owns and operates Lake Hemet Campground. Splash & Play Water Park is open from Memorial Day weekend to mid-September. Call (951) 659-2680. About 10 miles north of Idyllwild on Highway 243, Lake Fulmor is stocked with trout from spring through summer. The 2-acre lake occasionally freezes over in winter. A parking area is across the highway from the lake so use caution when crossing to and from the lake. species, the mountain yellow-legged frog. 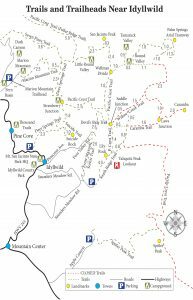 With approximately 200 miles of dirt roads and more than 40 miles of trails open to bicyclists, the San Jacinto Mountains around Idyllwild offer a number of experiences for mountain bikers of all levels. For that reason, the local mountain trails have become extremely popular among riders looking for challenging routes and breathtaking scenery. Local trails provide mountain bikers with a diverse selection of roads from which to choose. The Forest Service has mountain biking regulations in the San Jacinto and Santa Rosa mountains to ensure the safety of riders and the protection of natural resources. Bicycles may be ridden on established roads and trails within the mountains; however, bikes are not allowed within the San Jacinto or Santa Rosa wilderness areas or along the Pacific Crest Trail. The Forest Service also offers these safety tips for mountain bikers: Keep your eyes and ears open for equestrians and hikers on trails and vehicles on roads; helmets are highly recommended; control your speed; avoid riding after dark; and, carry a map (available at the Forest Service). Coyote Run: Closed until further notice. 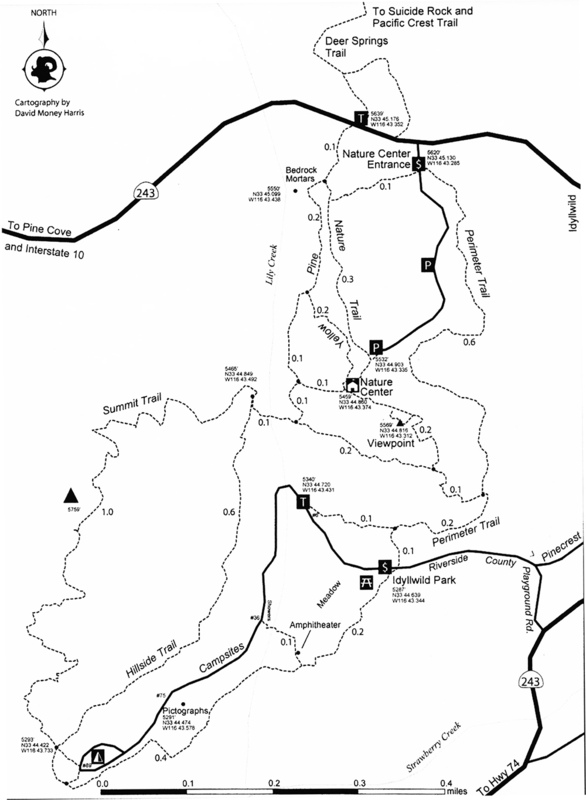 Beginning at the north end of Hurkey Creek County Park and ending at the waterfalls on Hurkey Creek, this easy and scenic ride is about two miles on a dirt road closed to motor vehicles. Parking is available at the day-use area within the Hurkey Creek Campground or outside the park. Fobes Ranch Road and Spurs: This trail s located three miles south of Lake Hemet on Highway 74 in Garner Valley. The roads are easy to moderate and offer more than two miles of mountain bike riding. May Valley Trail System: May Valley road is reopened after the fire. Some trails at the top and bottom of the road are also reopened. The Hub Trail System: This winding trail system incorporates great views of Alvin Meadow and the Grotto. 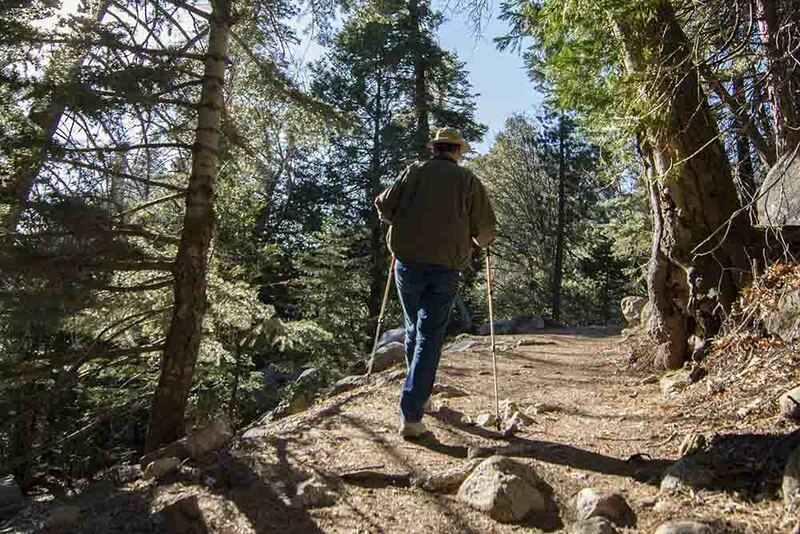 Trails climb from behind Idyllwild Arts up toward Pine Cove. Moderate to challenging. Thomas Mountain and Ramona Trail: This challenging 17-mile loop is considered one of the best rides in the area. It begins one mile south of Lake Hemet on Highway 74, six miles north of the junction with Highway 371. The dirt road ascends from an elevation of 4,500 feet to more than 8,700 feet in 13 miles to Thomas Mountain Peak, offering far-reaching views of Anza and San Diego below. 24-hour Loop: Closed until futher notice. Starting and ending at Hurkey Creek County Park, this challenging ride starts with a tough climb up to Keen Summit, traverses through Johnson Meadow and features a fast and flowy descent through chaparral to complete the 11-mile loop. Hurkey Creek day use fees apply. Other Trails: Pinyon Loop, South Ridge Trail and Webster Trail. In 1938 MGM, Metro-Goldwyn-Mayer, released a 10 minute documentary entitled “Three on a Rope.” This rock climbing documentary followed a group of three climbers as they made what had to be one of the first filmed ascents of Tahquitz Rock. The documentary also included a second group of three climbers, mostly for comic relief, in the Mt. Baldy area. The commentary is pretty hokey but seeing the climbers’ equipment and watching the climbing techniques they use is a unique window into the history of the sport of rock climbing. It was only two years earlier that Tahquitz saw the first ascent of the “Trough” which was originally rated at 5.0 but has since been upped to 5.4. There are many firsts that can be attributed to Tahquitz Rock including the decimal rating system for rock climbing. It was developed by climbers on Tahquitz but was later renamed the Yosemite Decimal System or YDS. The “Class” system starts at Class 1 for walking, Class 2 for walking with some use of the hands, Class 3 for scrambling using all four limbs on certain sections, Class 4 easy climbing with some exposure and maybe needing a rope for safety and Class 5 which is climbing with a rope and safety gear. Originally, climbs were rated between 5.0 – 5.9 but as climbing gear and techniques improved the 5.9 “ceiling” was reached by Royal Robbins on Open Book in 1952. Since then the degree of difficulty has progressed between 5.10 – 5.15 with the invention of shoes designed specifically for rock climbing, better harnesses and protection helping the next generation to push the envelope. Tahquitz saw its heydays from 1936 and on into the 60s and 70s when attention began to focus on Suicide Rock its smaller neighbor to the north. One of Suicide’s test pieces became Valhalla. With a 5.11 rating, Valhalla was the route to conquer for a group of climbers led by John Long known as The Stone Masters. Although Suicide routes are shorter than those on Tahquitz they now out number the routes on Tahquitz 300+ to just over 200 for the latter. 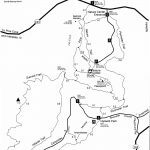 There are still new routes being put up on both rocks, but most of the new development is now focused on the outlying area called the Hinterlands and also a few scattered crags in Garner Valley. The turn of the century has seen a gigantic boom in bouldering that was once thought of as only practice or a warm up for “real” rock climbing. In fact bouldering seems to be the sport of choice for the young climbers as it is easier getting started and the cost for gear is much less. There are now several well-developed bouldering areas in our local mountain including Black Mountain, South Ridge, County Park and the tramway boulders at the top of the Palm Springs Tramway. The Tramway has its own guidebook and Black Mountain will soon have a separate guide if it isn’t already published. Black Mountain is particularly popular as a summer destination because at around 8000 feet in elevation it is much cooler than the surrounding desert bouldering areas. Every spring the boulderers are always chomping at the bit waiting for the gate at the bottom of Black Mountain Road to open. Although climbing is now a much more diversified sport, no matter what direction the world of rock climbing should take, Tahquitz will always have its place in the past, present and on into the future. Tahquitz still draws people from all over the planet and it remains Southern California’s biggest rock and most storied crag.